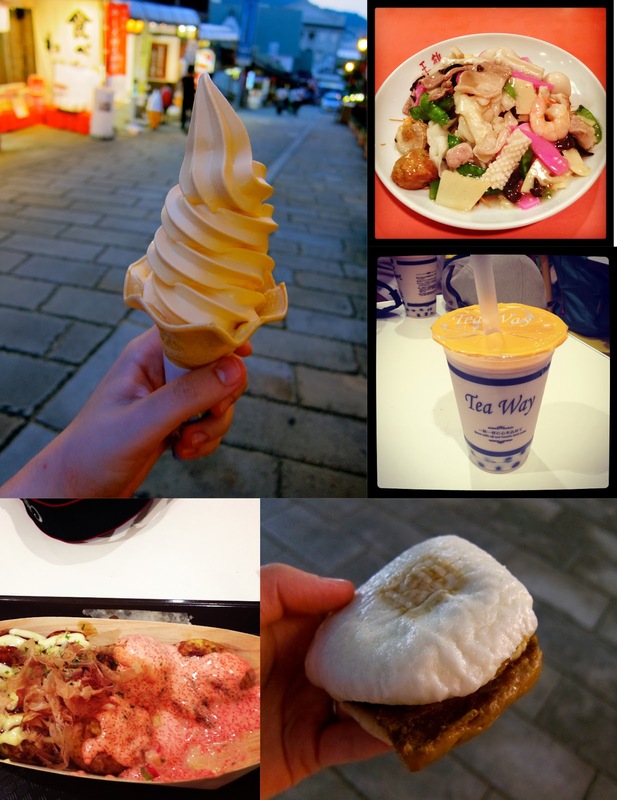 candidanimal: What did I eat in Nagasaki? Nagasaki is one of the few cities where I can definitely say I ate like a tourist….and planned to! Nagasaki has a long and rich foreign history, so its local specialties are a blend of Chinese, Dutch, and Portuguese cuisine. I arrived in Nagasaki on a hot autumn evening, so at dusk I walked to Chinatown, wondered the streets for a bit, and picked up a Niku Manju 肉まんじゅ. Niku Manju are tiny pork sandwiches in a rice bun. With a manju in hand I strolled down the Chinatown alleys, underneath a canopy of red lanterns. When night fell, I popped into a local restaurant, and ordered Saraudon. Saraudon 皿うどんis what Americans call “crispy chow mein”. It is a dish consisting of fried noodles that soften up in a thick gravy, with meant, vegetables, and seafood. There are several restaurants in Chinatown which are particularly famous for their cuisine, and you can tell which ones they are because there will be lines out the door of people waiting to be seated. Although I love the excitement of a busy restaurant, I didn’t particularly feel like waiting, so I went into a restaurant where I was the only customer for about 10 minutes, then the place filled promptly at 7:00. Ironically, the experience of eating Chinese food in Nagasaki, only made me miss Chinese food in America even more. The next morning I got lunch at a mall food court near Nagasaki Station. I was in the mood for takoyaki　たこ焼, and since mentaiko明太子 is a regional specialty, I got takoyaki with mentaiko sauce. For dessert I had a bubble tea. Despite being insanely popular in neighboring Taiwan, Bubble Tea is hard to come by in Japan. I was lucky I found it in Nagasaki! In the evening I visited the Glover Garden. A tiny cobblestone pathway with souvenir shops and food carts leads up the garden, and on the way back I got the seasonal loquat ビワice cream. My last meal in Nagasaki was spent at the pier at the Dejima wharf, where I stopped to have a light (yeah right) meal of sashimi over rice 海鮮丼. At home in Shimane, I was able to bring a bit of Nagasaki’s regional cusine with me, in the form of Castellas カスタラ. These are bite-sized pound cakes which are a relic of Nagasaki’s Portuguese past. Labels: 2013, Castella, Food, JAPAN, JAPAN Nagasaki, Manju, Saraudon, What Do I Eat?